If you’d like to submit your own testimonial please use our feedback form. The grandkids enjoyed coming to your store. Thanks so much for your friendly and wonderful service! My new pool table looks fabulous. Dave and his assistant showed up this morning, brought in the pieces and assembled my table. My old table was a throw back (away) so this new one looked amazing. Dave couldn't have been more professional or helpful. If you have need of a great and reasonable pool table, This the Guy! Thanks Dave! Great service! Thank you for making our move a little easier. We just recently had our pool table moved to a different room. The service was great. The guys were super nice, mellow and got the job done easily and quickly. Really interesting watching how its done. DK Billiards came and moved my pool table, replaced the felt and made it brand new! This was the best thing I ever did! Thank you so much DK Billiards! David and his guys did a great job at a fair price. Showed up on time worked with my needs. David and crew were wonderful to with. We had great service at the store while selecting our table and the installation was very professional, on time and enjoyable. 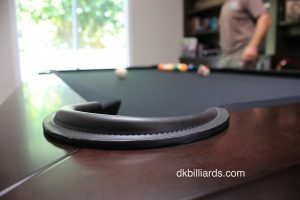 We would recommend DK Billiards to our family and friends anytime. Couldn't have been more pleased great communication fast courteous and ultra knowledgeable!! I highly recommend them! From the time we walked into DK Billards and met Dave we felt comfortable and happy that we would find the right pool table for our home. Dave was extremely helpful and knowledgeable and very easy to deal with. His pricing was fair and their service and delivery was superb. I spoke with Rory his wife on the phone for delivery information and they are just AWESOME people and I would recommend that everyone who wants a GREAT pool table experience should absolutely use DK Billiards. We were in a bind without proper pool sticks to play pool at our family gathering on Thanksgiving Day. David was kind to take his personal time out on Thanksgiving morning to help us out so that we can enjoy a wonderful time of family pool playing. Thank you so much David and your beautiful family for your all your expertise and professional help and generosity! Dave and Rory are the best! 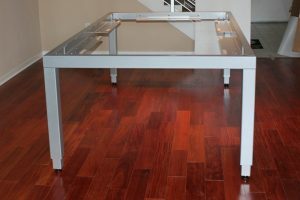 The company I bought my table from is no longer around but I was referred to them by my moving company. They were a pleasure to work with and were friendly, prompt, professional and got the job done to perfection! Highly recommend using them! We had an amazing experience with Dave and Rory and would highly recommend them!! We needed to move our pool table from the mountains to the beach which included a very tricky staircase! Dave and Rory could not have been more helpful, friendly, or professional and were willing to take on the challenge. Not only did they do an awesome job, but they exceeded our every expectation...even working within a deadline to help us get the table ready for a party. 5 STARS for sure! Very happy with the service. Completed as promised at reasonable cost. These guys were wonderful. I saw their website on Google, and then went in to their showroom, and a guy named Kevin helped me pick out a table for our house. What I really liked about this place was the he helped me every step of the way with choosing a good table for my family. So i bought a Connelly table and then 6 weeks later they had built in and were delivering it to my house. There were 2 guys who came to my house, one was Dave the owner. I thought that was really cool that they did their own service work. And about 2 hours later they were finished and I had my table all ready to play. I liked that they gave me all the accessories to go with it, and didn't have to pay extra. They also told me they do service such as moving and putting a new color of cloth on the table, which is great for down the road! I'm very happy with my choice of using these guys. Highly recommended! I bought an Aramith Fusion from David and it is a dream, perfectly installed with absolute precision, everything went as scheduled , you will never have any problems with DK Billiards. I would recommend them to anyone who wants the highest standard of efficiency, professionalism and great value. We bought a beautiful C.L. 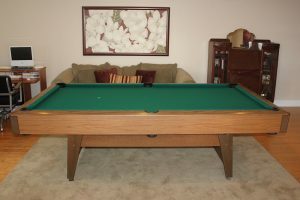 Bailey pool table from DK Billiards and are so happy with it! The owners David and Rory are so friendly and knowledgeable, working with them has been terrific. We highly recommend going to see them if you're looking to buy a pool table! PLACE MORE ASSEMBLY PHOTOS FROM THE TREVISO BRUNSWICK TABLE.